Arresting texture modernizes the charm bracelet. Toggle clasp with logo detail. Armenta wrap bracelet from the Old World Collection. 18-karat yellow gold and blackened sterling silver. 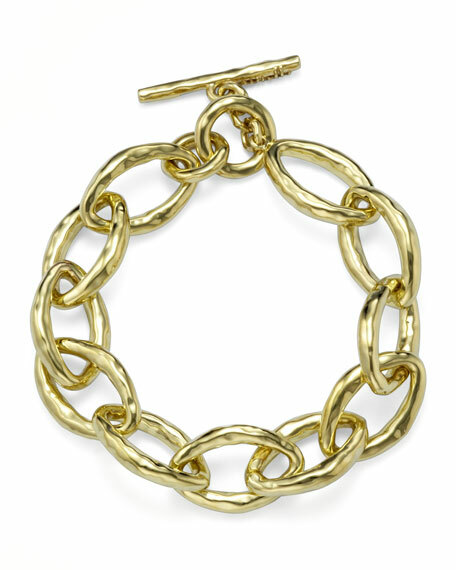 Double-wrap chain with textured circle links. Champagne diamonds and black sapphires. Double-sided pav?? disc drop with crivelli. Approx. 14-14.5"L chain; 0.5"L drop (12.5mm). 0.22 total diamond carat weight. Adjustable; toggle clasp. Made in USA. Gorjana adjustable beaded bracelet from the Power Gemstones Collection. Polished 18-karat yellow gold-plated brass hardware; knotted nylon cord. Petite faceted, round labradorite beads. Natural color variance may occur. Curved, hammered bar at center. Pull-through slide closure. Approx. 9"L; 2"L bar. Imported. EXCLUSIVELY AT NEIMAN MARCUS Ippolita three-station bangle from the Nova Collection. 18-karat yellow gold bangle with three stone stations. Choice of gold-matrix turquoise or mother-of-pearl. Oval-shaped for secure fit; 2.6" x 2.3" opening. Imported.